TenrikNiels: Are you prepared girl? TenrikNiels: it is indeed a delight to see you this day as well sweet one. TenrikNiels: *Lifting her to her feet, he would strip her silks from her , handing her to the guard and watching as she is bound to the whipping post. TenrikNiels: Today girl you will become truly a citizen of the Oasis, as this whipping will take all those things from you that should not be.. You have worked hard to get to this day, I and others have watched, listened as you have grown, learned and progressed to reach this most special of days"
TenrikNiels: The first five lashes girl to show where you have been .. Moving from what you were to what you are to be..
TenrikNiels: Nove, these lashes will remove from you any jealousies, envies,you would or may have towards any of your sisters. Among your sisters there is no place for such, to teach and remind you to hold your tongue, for you to remember always your last words are forever to be ... "Yes Master/Mistress"..
TenrikNielsTenrikNiels Whisper: These last ten lashes girll will mark the path you are now set upon, to become one of the finest, the best kajira/slaves in all of Gor.. tell me girl, who are you? TenrikNiels: Who owns you girl ? TenrikNiels: Once your Mistress arrives(returns) she will change your name girl, you will belong to her as er personal as well as belonging to the city..
erisOasisScimitars: (posting this quote for Master) "'I have not begun to punish you,' I told her. She looked at me with fear, and wonder. I tied her small garment, which I picked up from the floor, about her neck, and her hands behind her back. I strode through the halls, she, stumbling, running, following me. Outside, I untied her, and then retied her, belly up, head down, over the saddle of a kaiila, and took her to the nearby kasbah, which had once been that of Tharna. There I took her down to the forth level, the lowest level, and, throwing the tiny garment into the cell, whence it would be retrieved later, I took her to the branding chamber, threw her into the device, and locked it on her thigh. Hassan was there and the iron was already hot. It was the same iron with which he had, the night before, marked the proud Tarna. It had been cleaned, with a solvent. One iron, properly cared for, can mark thousands of women. 'No, Master,' she said, 'please!' 'Do you wish to mark her?' asked Hassan. 'Yes,' I said. I would place the mark on her left thigh, above that of the four-bosk horns. It would be the common Gorean female slave mark, fitting for a low girl, such as she, one who had not been fully pleasing. I held up the iron, white hot, for the girl's inspection. 'You will soon be branded, Girl,' I told her. 'Don't brand me!' she cried. 'Please don't brand me!' She wept. Hassan regarded her with interest. 'We are now ready,' I told her. She looked at me, then at the glowing, white-hot marking surface of the iron. She watched it with horror, as it approached her. I held it poised at her thigh. 'Don't!' she cried, 'Don't!' 'You are now to be branded, Slave Girl,' I told her. 'No,' she screamed. Then I branded her. For five long Ihn I held the iron, pressing it in. I watched it sink in her thigh, smoking and crackling and hissing. It was a larger brand than that of the four-bosk horns; I made sure it marked her more deeply. We three, Hassan, I and the girl, smelled the marked, burned slave flesh of her. Then, swiftly, cleanly, I withdrew it. Her head was back. She was screaming and weeping. 'A perfect brand,' said Hassan, looking on. 'Perfect!' I was pleased. Such a brand would be envied by other girls. It would improve the sleek little animal's value. "Tribesmen of Gor page 358. TenrikNiels: ... The smell of her burning flesh fills the room, he smiles, the count continuwes as he keeps the iron to her skin"
erisOasisScimitars: *her shreiking scream striking her inner ear*..
TenrikNiels: *Placing the iron back in the coals, he steps in close once again to the girl. 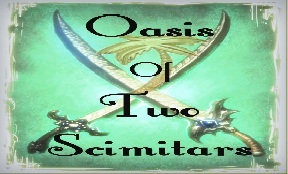 today you have completed the journey atarted many days, weeks ago, today rya (soon to be renamed) congratulations girl... you are now oficially a citizen to the Oasis Of Two Scimitars..
YingfaLee: -bowing down she kisses the stones and speaks softly- may girl be permitted to enter should it so please the Free? TenrikNiels: Today girl, you will remain naked, make sure to see the Master Physician as he will tend to the wounds and brand..
TenrikNiels: For now I am certain your sisters can assist you with what you may need until then..
~smiles brightly ~ congrats little one this was well earned. ~hugs tightly~ glad to have you among the Oasis girls.